It is…a mistaken idea to suppose that strikes are modern inventions. They are indeed of ancient origin. Livy speaks of an or­ganized strike in the year 312 b.c., the description of which, although sufficiently humorous to make a background to a classical comedy, shows nevertheless the power of those ancient unions when de­siring to use the strike as a weapon for their rights. The strikers on this occasion were the musicians, and the strike was caused by an act of the public censors, that seemed an infringement on the rights and privi­leges of the former. The musicians, who always assisted at the worship of the gods, enjoyed the privilege of annually cele­brating a feast at communal expense in the temple of Jupiter. In the year 312 B.C., however, Rome hap­pened to be in financial straits; the Sam­nite wars had swallowed up millions; just then large sums were needed to fight the Etruscans, who had risen against Rome and who had a great and well-equipped army. The newly elected censors there­fore advised the Roman senate to curtail all the domestic expenses, especially to grant no money for the annual feast of the musicians. The censors then conferred with the board of the musicians’ union, explaining the position and telling them to forego their usual festivities. The musicians could not see the necessity of being de­prived of their pleasure, they protested against the censorial order, and the board ordered a general strike. 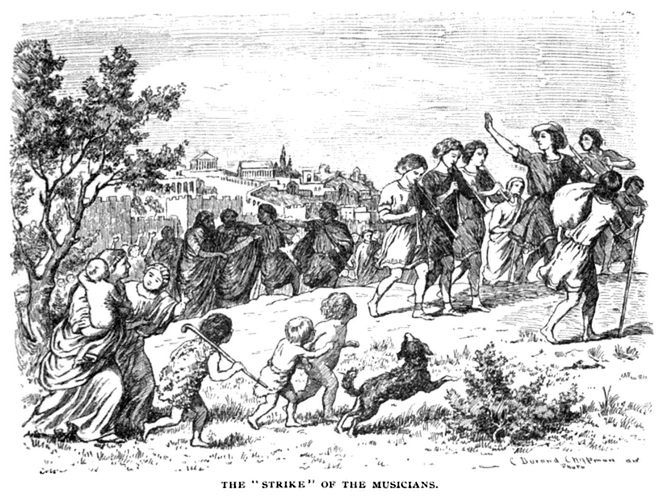 Headed by their corporation standard the strikers paraded the streets of Rome, and finally left the city, marching toward the city of Tibur. In the latter place they encamped for an indefinite period, deter­mined not to return until the censors granted their annual feast in the temple of Jupiter Optimus Maximus. Unimportant as this strike seems, it amounted almost to a calamity for the Romans in a religious sense. It was evident that the assistance of the gods was needed in the coming war with the Etruscans. To gain this assist­ance public worship and sacrifices were necessary, at which music was indispen­sable. The musicians being on a strike the sacrifices could not be instituted, con­sequently all chances of obtaining the oracle of the gods were diminished. As there was no way out of the difficul­ty, the Roman senate concluded to send a deputation to the municipal govern­ment of Tibur, asking it as a neighborly favor to intercede with the musicians and induce them to return. The Roman sen­ate also empowered the Tiburtian author­ities to promise the strikers any number of moral privileges, provided they entailed no financial outlay—Rome could not af­ford any just now. The Tiburtians received the Roman dep­utation with much friendliness, promising to do all in their power to effect an ami­cable settlement of the difficulty, and at once communicated with the leaders of the strike. But the latter claimed their rights, maintaining deaf ears to the ear­nest solicitations of the Tiburtian fathers as well as to the seductive promises of the Roman senate. There was no time for long negotia­tions, it being the day preceding the one set for the sacrifices, and as delay might displease the gods, the Tiburtian elders thought they owed it to their sister city, Rome, to do all they could in order to bring the strikers to terms. They held a meeting, and at the sug­gestion of one agreed upon the following stratagem: the “famous Roman musi­cians” were to be asked to give a con­cert, which it was thought they would not refuse. They were then to be treated with plenty of a cheap but very strong quality of wine that belonged to the city. As they were musicians the chances were that they would drink themselves to sleep, in which case they were to be gently placed in covered wagons and quietly driven to Rome. This suggestion was carried out to the letter; the snoring strikers were driven to Rome, directly into the famous Forum, where everything was prepared for tomorrow’s sacrifices; the horses be­ing unhitched the wagons were left under guard till morning. The services were to begin with the rise of the sun, and a large multitude thronged the Forum eager to witness the ceremo­nies. As the report was spread among the people that the musicians were in the Forum, and also by what stratagem they had been brought back from Tibur, gen­eral hilarity prevailed in the crowd. And when the musicians awoke from their in­ebriation and emerged from the wagons, they were greeted by a joyous roar of the multitude. *In fact, the first recorded strike took place during the construction of the Great Pyramid of Cheops, around 1580 B.C. The Greek historian Herodotus writes that the workers received a ration of garlic each day to increase their stamina and for general health. When one ration was not delivered, they held a work stoppage. This entry was posted in Uncategorized and tagged 4th Century BC, Ancient History, Labor, Livy, Music, Religion, Rome, Strikes, Unions. Bookmark the permalink.